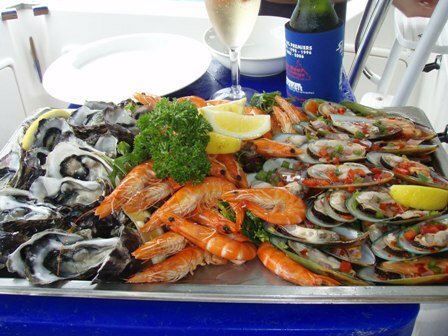 Freshly caught seafood eaten ‘au natural with a glass of wine is excellent at sea and a gourmet delight! 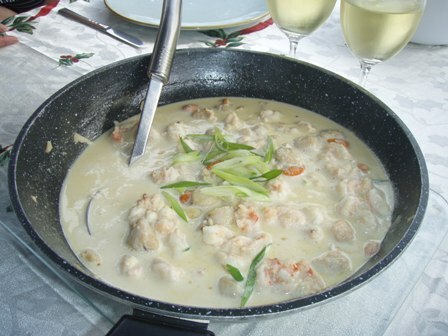 One pot meals are an essential part of cruising cuisine on yachts with limited room and cook top space. When at sea there's nothing quite like the mouth-watering aromas of a simmering pot of yummy food, there is something about the sea air that seems to make you hungry. A big deep frying pan or a pressure cooker is best used. Cream; ……no fresh cream then use tinned Light Ideal milk. Garlic crushed, salt and pepper. Flour, pasta or rise, and shallots. In your deep pan cook a variety of seafood in a small amount of butter and garlic till just cooked. Make a sauce of cream, crushed garlic and use flour to thicken. Accompany with rice or pasta and garnish with shallots. Or an amazing filling for crepes or if you have Vole-o-vents fill them for a real gourmet meal. A simple one pot dish ‘yummy’ and easy! An alternative is to use tinned crushed tomato, garlic and herbs, and serve over pasta, or put in crepes. Now this is seriously 'to die for' cruising cuisine. 1/2 tsp lime juice and 2 shallots sliced, if available. In a deep pan heat oil over medium heat; cook onions and garlic for 5 minutes or until softened. Add curry powder, salt and pepper; stir for 1 minute. Add coconut milk, tomato and stock; bring to boil. Reduce heat; simmer for 25 minutes. Add fish; cover and cook for 10 minutes or until fish flakes easily with fork. Stir in lime juice. Serve sprinkled with shallots if available. Cruising cuisine should have a good variety of seafood dishes. Potatoes to accompany the stew. Heat the oil over a medium heat in the pressure cooker. Sauté onion and carrots in the oil until onion is tender and transparent, about 5 minutes. Stir in beef cubes, 1 cup beer, 1/2 cup water, salt, pepper, and bay leaf. Put pressure cooker lid on and cook as instructions, you should be able to take it off the heat in 15 -20 minutes. Let it sit for an equal amount of time and you have a tender tasty stew that can be served with mashed potato. This can be made in your big pan on the stovetop if you don’t have a pressure cooker, it will take about 2 hours at a slow simmer. This is great cruising cuisine in cold or bad weather. Heat the oil in the pan over a fairly high heat. Season the chicken joints, adding 4 of them to the hot oil to sauté till golden. Add the onion, pepper and chorizo and fry these over a medium heat until lightly brown. Add the garlic, paprika, cayenne and saffron and cook for another minute. Return the chicken to the pan, the tomatoes, plenty of seasoning and 1.2 liters boiling water. Bring to a gentle simmer, turn the heat down and cook, uncovered, for 10 minute. Fry the vegetables and bacon in butter until soft in deep pot. Add the soup with extra can of milk or cream and the corn. Simmer on low heat for 5 minutes. Serve with some crusty bread, ...cooked in pressure cooker. Great on a night watch when off shore sailing! Mix everything with a hand beater until smooth. Shape in a ball then sprinkle with your choice of sesame seeds, poppy seeds, cayenne pepper, etc. Eat with corn chips. I also cut pita bread into wedges, drizzle with a little olive oil and sprinkle with cracked pepper and toast them in the oven. Cut top off Cobb Loaf and dig out the soft bread and keep for dipping. Mix all ingredients together and place in cob …surround with bread pieces and biscuits … put cob lid on until ready to enjoy!! Great for sundowners with cold drinks and good company! Combine water, yeast, salt and sugar and allow to stand for 4 minutes. Stir in flour and allow to rise in a warm spot for a couple of hours. Grease pressure cooker with oil and coat sides with flour. Press dough down with a fork and place in cooker. Allow dough to rise again, then place cooker over low heat with the lid on, but without the pressure control. Cook for 35 minutes then flip over and return to cooker to brown the top for a further 10 minutes. Mix the ingredients to a smooth consistency. Pour into a well greased bread tin. Bake in a hot oven for 1 hour or until golden brown. Remove from tin and cool. Mix dry ingredients. Pour in condensed milk and rum and mix well. Refrigerate for ½ hour then shape into balls and roll in coconut. Keep refrigerated. (5 minutes ) If you have a microwave! This can be for two with a big dollop of cream or ice cream. Some yachties in Australia make home brew on board, not being a beer drinker myself it’s hard to judge but I’m told some is barely drinkable, some is excellent. And all part of the sailing scene, sun-downers and cruising cuisine. Supermarkets in Aussie carry a range of brew kits and different brews from stout to light lager. Instructions are provided for the first timers. Use a 5 gallon carboy as a fermentation vessel and screw cap plastic 1.25 L soft drink bottles for storage. When bottling boat motion can be a problem stirring up sediment, but this seems to be overcome by most sailors. Temperature can be controlled to some degree by keeping the fermenter near the waterline in the hull. 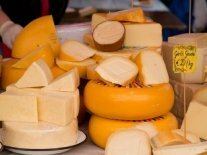 Aussies are passionate about their beer and this is a definite when looking at cruising cuisine options with many of them. Brewing your own beer is far better on the budget. Not a beer drink prefer your wine, or a spirit and mix .... all can be made cheaply on board. And why not finish the night with a 'home' made liqueur. 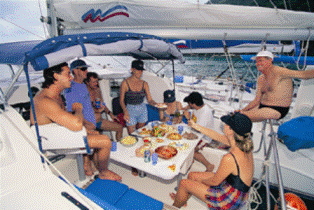 You can eat and drink gourmet style while out cruising. From cruising cuisine would you like to go back to galley provisioning?